Today here at Seeds to Plate we had an exciting guest come and teach our students about chemistry in a unique way. Chef Clemance Gosett of La Gourmandise Cooking School visited our 8th grade Chemistry classes for a lesson of “Cooking with Chemistry”. The fun and interactive lesson touched upon mechanical reactions, catalysts, and acids/bases. All the while Chef Gosett was demonstrating how to create ricotta cheese and butter to use for a yummy and easy snack! In June, 2016, Seeds to Plate, the Gjelina Volunteer Program, Mark Twain Middle School and the Venice Boys and Girls Club teamed up to 20 students with a hands-on workshop to create their own restaurant. They designed their menu, learned to cooked an appetizer, entree and dessert, divided themselves into front of house and back of house staff, and served their family a three course meal in Mark Twain's Secret Garden! Thanks to the Creative Artists' Agency for their wonderful effort working in the garden! Students picked flowers from the garden to make beautiful bouquets with touching notes for mom. They love and appreciate you, Mom! Clara the Farmer Visits the Classroom! 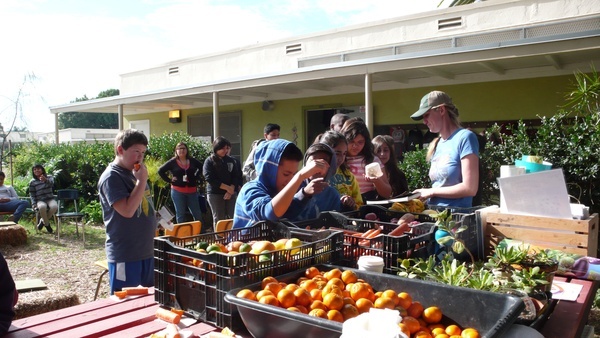 Last week, 200 Mark Twain Middle School students attended our Farmer in the Classroom program and were treated to a visit from Clara, of Tutti-Frutti Farms, located outside of Lompoc. Clara brought all kinds of fruit and vegetables from her farm; carrots, tangerines, avocados, squash, white and sweet potatoes and more, and taught us through stories and photographs just how their organic farm works to grow and distribute their delicious produce. She also helped explain how important the nutrients from all fruits and vegetables are for our health. Specifically, Clara explained the health benefits of the carrots from her farm; how each carrot contains a high amount of vitamin A, which helps our eyes, skin, and brain. She brought carrots for all to taste, along with tangerines, and students happily munched on these organic goodies. Students had an opportunity to ask Clara questions. Most were curious about whether she liked being a farmer. She loves it and invited students to think about becoming farmers themselves! Students created herb bouquets for their families and holiday cooking. Sprigs of rosemary, thyme, oregano, sage and bay leaves were tied with cinnamon sticks and star anise. Happy holidays to all our students, parents, partners, supporters, and friends! MTMS 6th grade students participate in an Aqua Explorers field trip and beach clean up sponsored by Heal the Bay and Project Wet. It was a great opportunity to learn about how we can and should take care of the earth! Seeds to Plate asked the 20 teachers who partnered with us this year to choose a student who has shown marked improvement this year to be honored. The student was asked to choose a parent, or other relative, to come and be honored as well. Amazing volunteer chef Karen Wong, who has worked with us previously, worked with parents and students to prepare this delicious meal: Panamanian Jerk Chicken, Cole Slaw, Cilantro and Coconut Rice, sauteed greens from the garden and Hibiscus/Ginger Water Beverage. Special thanks to Whole Foods for donating fresh produce for this meal! Students enjoy interacting with shoppers as they sell brussel sprouts, chard, kale and other produce they grew from seed in our school garden.